Mechanical engineering is associated directly with the analysis, design, manufacturing and maintenance of various machines from space crafts, transport machines, power generators, and industrial machines to household appliances in our everyday life. Our aim is to provide students with the scientific and technological knowledge, and to develop students’ ability to be researchers and engineers who can make contributions to the development of mechanical engineering worldwide. Mechanical engineering is founded on the following sub-disciplines (1) mechanics (solid mechanics, fluid mechanics and thermodynamics), (2) control and information, (3) methodologies of design and manufacturing. Department of Mechanical Engineering consists of five divisions: environmental fluid engineering, thermal energy system engineering, advanced material system engineering, design and production system engineering, and intelligent machine system engineering. 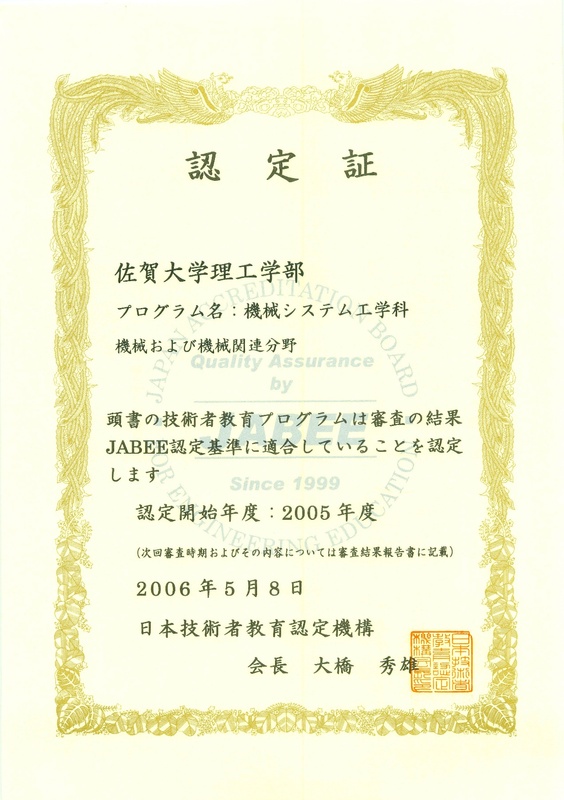 The department was authorized by JABEE (Japan Accreditation Board for Engineering Education) in the academic year of 2005 in the field of mechanical engineering. Department of Mechanical Engineering is accredited by JABEE (the Japan Accreditation Board for Engineering Education). JABEE has been a signatory to the Washington Accord. Copyright © 1999- Department of Mechanical Engineering, Saga University All rights reserved.